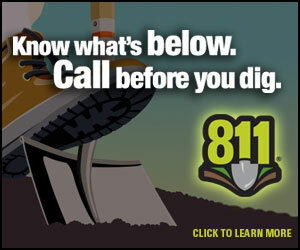 National 811 Day – Dig It! Calling 811 before an excavation project is like wearing your seat belt — both can help save your life. Sunday (8/11) is National 811 Day, a time to call special attention to the need to always call 811 so underground utilities can be marked before digging starts. In Pennsylvania, state law requires the call to be made any time powered equipment is used. Calls also need to be made at least three business days before digging starts. The Common Ground Alliance, an association dedicated to reducing damage to underground utilities and promoting digging safety in North America, says calling 811 is the key to success. According to the alliance, damage occurs less than 1 percent of the time when an excavator notifies a local one-call center before digging. The group estimates the total number of damages could be reduced by nearly a third if all digging were preceded by a request to locate underground utilities. PPL Electric Utilities responded to about 240 accidental digging contacts with its underground lines in 2012. Of that total, more than 40 percent were not preceded by an 811 call. Information on 811 and safe digging can be found at www.pa1call.org, www.call811.com or www.commongroundalliance.com. More safety information for customers, contractors and first responders can be found at www.pplelectric.com/safety.